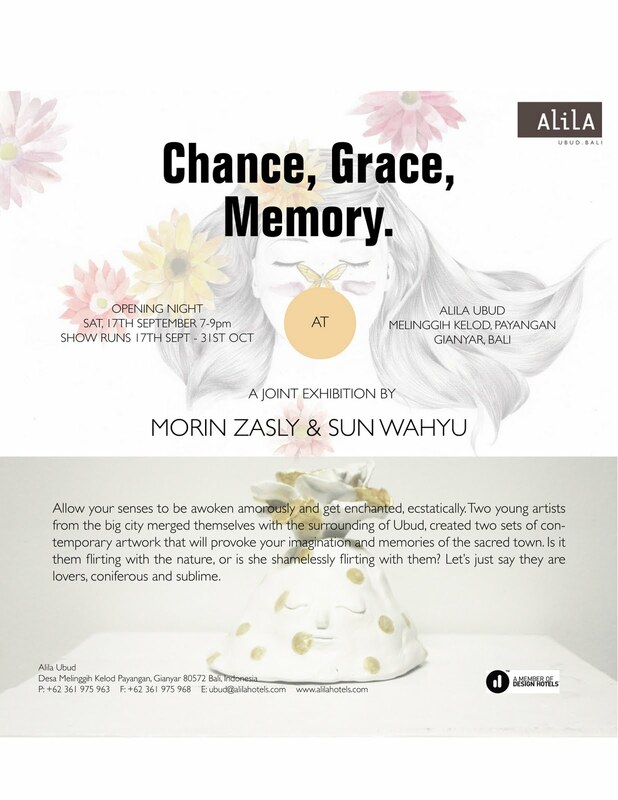 Morin Zasly: CHANCE, GRACE, MEMORY. This month at Alila Ubud. Allow your senses to be awoken amorously and get enchanted, ecstatically. Two young artists from the big city merged themselves with the surrounding of Ubud. They gave themselves to each other, honored one another and all of creation in the union, recognizing the infinite ancestral familiarity. Is it them flirting with the nature, or is she shamelessly flirting with them? Let’s just say they are lovers, coniferous and sublime. Two sets of contemporary artwork will provoke your imagination and memories of the sacred town. Sun Wahyu, will reveal the honest and childlike side of memory through his clay art and painting, whilst Morin Zasly illustrates the flirtatious connection between beauty and the nature. Observing Morin's art, my imagination sucked into a parallel universe where she let herself lustfully courted by delicious feel of Ubud. Where nature nibbles at her inspiration, lullabies her pencil sweetly, showers her idea with dreamy gifts, and everything wrapped from head to toe in gloriously gorgeous greenness. The mixture of pencil, charcoal and limited warm palette in watercolor brought a sense of escapism, glamour and kitsch into her works. In a very delicate and elegant way, Morin juxtaposed the exotic animal and foliage of the island with women's quirky expressions, manners and fashion into alluring narrative illustration, as if all the objects have their place and reason for belonging in the artwork. Whether it is a dash of fiery red or moody violets, the colors she used are conveying the deep emotions and passion that she swam in, representing romanticism, friendship, love, grace and fate - both literally and metaphorically.